Briere, John et al. (1988) “Symptomatology in Men Who Were Molested as Children: A Comparative Study”, American Journal of Orthopsychiatry, 58:457-461. Briere, J., & Scott, C. (2006). 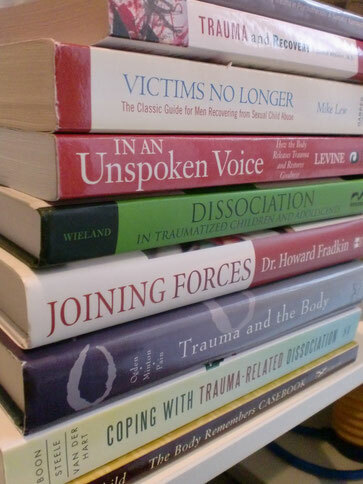 Principles of trauma therapy: A guide to symptoms, evaluations, and treatment.London: Sage Publications. Crowder, A. (1995). Opening the Door: A Treatment Model for Therapy With Male Survivors of Sexual Abuse. NY: Brunner/Mazel Publishers. Dolan, Yvonne (1991) Resolving Sexual Abuse.New York: W.W. Norton. Etherington, Kim (2000) Narrative Approaches to Working with Adult Male Survivors of Sexual Abuse.London: Jessica Kingsley Publishing. Gartner, Richard B. (2005) Beyond Betrayal.New York: Wiley. Gartner, Richard B (1999) Betrayed as Boys: Psychodynamic Treatment of Sexually Abused Men.New York:GuilfordPublications. Hunter, Mic (1989) Abused Boys.Lexington,MA:LexingtonBooks. Lew, Mike (2004) “Adult Male Survivors of Sexual Abuse: Sexual Issues in Treatment and Recovery”, Contemporary Sexuality, Vol. 38, No. 11. Lew, Mike (2004) Victims No Longer: The Classic Guide for Men Recovering from Sexual Child Abuse. (Second Edition: Revised and Updated).New York: Quill Editions (HarperCollins). Lew, Mike (1999) Leaping upon the Mountains: Men Proclaiming Victory over Sexual Child Abuse.Boston: Small Wonder Books andBerkeley,CA:North AtlanticBooks. Lew, Mike (1996) “Men in Recovery from Sexual Child Abuse: Obstacles and Triumphs”, Psychotherapy in Australia　2(2):39-44. Rothschild, B. (2003). The body remembers: Casebook. NY: Norton & company.